Premier League ScoopsZone is a new adware grogram that could cause you a lot of trouble if you do not act cautiously by avoiding its advertisements. Indeed, its advertisements are untrustworthy, and we recommend that you remove this program at your earliest convenience. The program is advertised as a useful browser extension that is set to provide information about the Premiere league. The information provided by the application is somewhat useful and legitimate, but its cons far outweigh its pros. So delete this infection if you do not want to learn about its cons first-hand. 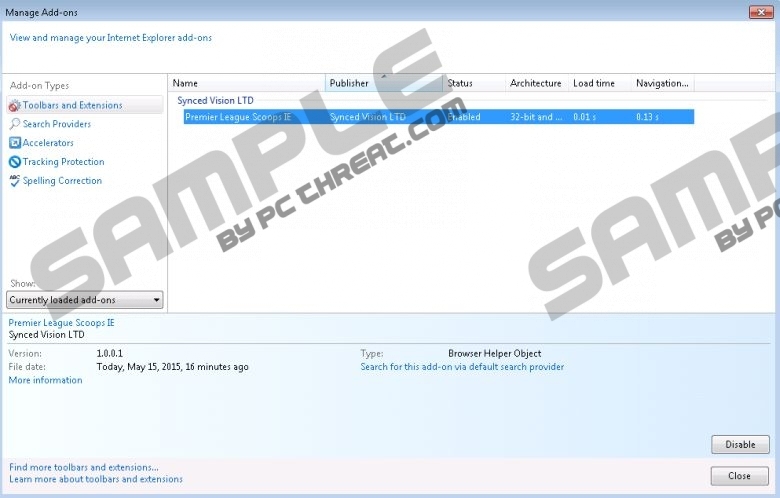 The application can be downloaded from a website, called Premierleague.scoops.zone.com the application had immediately aroused our suspicions when we at Pcthreat.com learned that the application is based on the CrossRider engine. The engine is widely used for making aggressive adware applications that obstruct browsing experience by constantly annoying you with ads. So you should remove Premier League ScoopsZone simply because it is annoying. However, the application has not been made to annoy, but to make money. Once infected with it, the application will constantly display a coupon that offers you to place a free bet. But in order to place it you must register on a website called Betway.com. The registration process will require you to enter personal information, such as name, last name, country, region, city, and address. But if that was not enough it will also demand your birth date, postal code, phone number, and so on. We do not recommend that you provide this information, given the fact that there is absolutely no way of knowing who will receive your information and how it will be handled. We also recommend that you remove Premier League ScoopsZone, because it is capable of collecting information about your browsing and search preferences. This kind of behavior cannot be tolerated no matter how great the application looks and functions. More so, the application neglects notifying or asking for permission to collect data. The browser extension provides legitimate and relevant information about the Premier League, but its benefits do not compensate for its shortcomings. Therefore, we recommend that you remove it in order to save yourself the trouble of dealing with greater unforeseen problems, because there is no way of knowing to whom your information is set, and will you get your free bet at all. So you can use our manual removal guide provided at the bottom of the article or you can use an anti-malware scanner that could remove Premier League ScoopsZone for you. We recommend the latter removal method, because manual deletion does not always bring desirable results. Find Premier League ScoopsZone and right-click on it. Click Remove Premier League ScoopsZone. Click Remove Premier League ScoopsZone and click Close. Quick & tested solution for Premier League ScoopsZone removal.